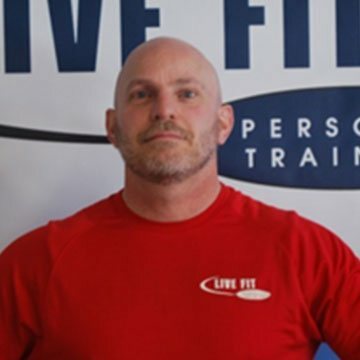 Specialties: Fat loss/ weight loss, core conditioning, weight training, Pilates and yoga inspired strength training, flexibility, balance, uniquely skilled to work with teenagers and older adults. 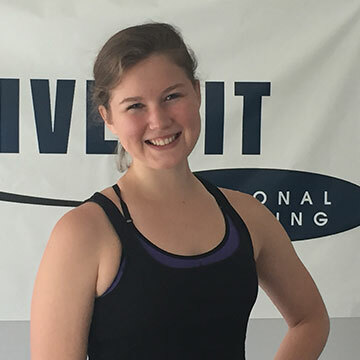 Background:As a competitive swimmer and soccer player for 10 years and now a professional ballet dancer Laura has a wide variety of skills to offer you in her training. As a trainer she incorporates yoga, pilates, and barre techniques to supplement her traditional strength training. 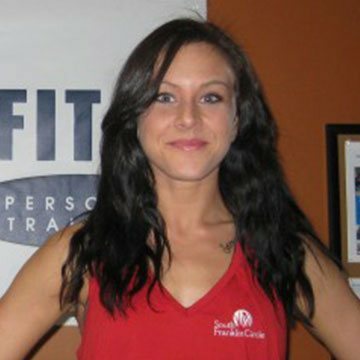 Laura has unique skills to help you build a strong, lean, and agile body. She has helped people of all ages get stronger, build their core and improve their balance. She also has a lot of experience working with teenagers and older adults. Interests: Spending time with family and friends, performing with her ballet company, watching movies, taking barre and pilates classes, and reading. 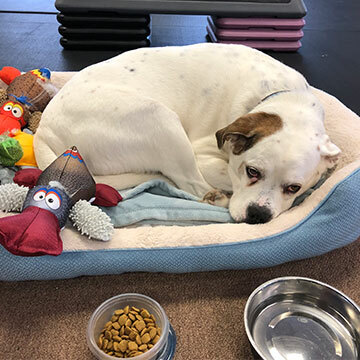 Background: Bentley is Live Fits live-in emotional support animal. You can always expect to find him lounging on the lobby couch or in his bed out on the gym floor. You may or may not be greeted by him upon entry, depending on his nap schedule & whether or not you’re known to carry snacks. His relaxed nature provides the gentle reminder that you should “get to work”, because he sleeps enough for all of us. Specialties: Fat loss, older adult training, cardio kick boxing, strength training, military/ law enforcement conditioning, flexibility, core conditioning. Background: I am 60 years young and can’t wait to teach you all about staying young, fit, and healthy! Commitment, perseverance, motivation, and discipline are values I learned as a Marine. Values which helped me attain the rank of Sergeant. Adherence to these ideals has helped me attain many goals since such as building a strong, fit body and healthy lifestyle. These are ideals I not only teach my clients, but ideals I live by as well. With your commitment and my guidance, I can help you improve your personal level of fitness. Individually tailored programs, short and long term goals, and fast pace dynamic circuit training and kickboxing are just a few of the ways I help my clients stay motivated and get results. Interests: Fitness, kick boxing, motorcycling, cooking, and music. Specialties: Fat Loss, strength training, fitness competitions, older adult and special population training. Background: I love weight lifting. I enjoy helping both men and women build muscle to achieve a stronger, leaner body. I am a nationally qualified NPC competitor. I have competed in 5 amateur events, twice finishing in the top 3 and took the stage at my first national competition in June of 2014. I have also coached hundreds of young women and helped them prepare for fitness and bikini competitions. A large part of my career has focused on special populations, mostly older adults. I have participated in research on Parkinson’s disease, Parkinson’s dementia and how exercise can positively affect the symptoms of the diseases and I am a certified Delay the Disease instructor. Specialties: Fat loss, functional training, sports specific training, youth training, older adult training. 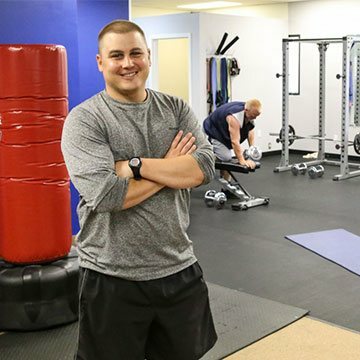 Background: As both a Registered Dietitian and an NSCA Certified Strength and Conditioning Specialist I am uniquely positioned to help you get the most out of your workouts. You can’t out work a poor diet! Whether you work with me, or one of our highly skilled trainers, I’ll help you develop a customized nutrition plan that gets to your goals faster. Nutrition is the key to living a fit, strong, and healthy life. As a trainer my philosophy is to make you better at what you do every day, whether that means putting away the groceries, doing yard work, or playing a sport at a high level. Together, we’ll build lean muscle in a way that translates to real life ability. I’ll keep you moving at a brisk pace to keep the heart rate up, burn fat, and give you as much value as possible for your training session. A typical workout with me includes a warm up with dynamic mobility drills, a total body weight training circuit with cardio and mobility drills mixed in, and finally a cool down to keep your muscles loose and leave you feeling relaxed, yet energized. Personal: Spending time with family and friends, playing softball and golf, watching football.